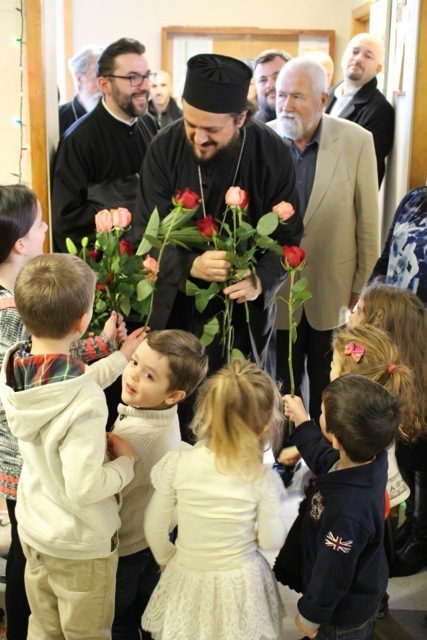 Portland, OR - The past weekend of January 9 and 10, 2016 at the St. Stephen Archdeacon and Protomartyr Serbian Orthodox Church in Portland, Oregon was very blessed because our Diocesan Bishop His Grace Bishop Maxim visited our Portland Parish. The reason of His visit was the celebration of our Parish Slava, which began with a Vespers, served by Prota Lazar Vasiljevic and Fr. Vidoslav Vujasin in the presence of his Grace and the faithful. 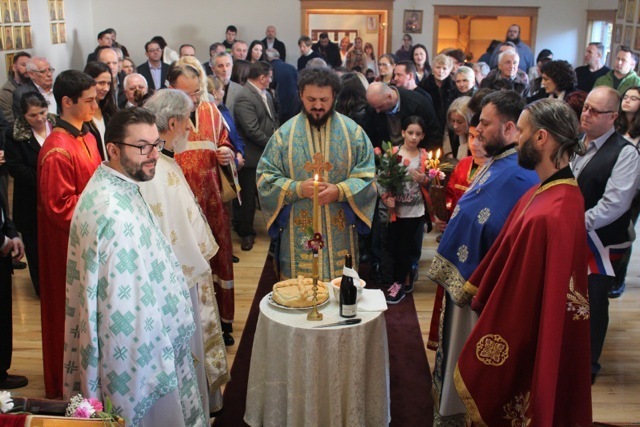 His Grace Bishop Maxim served the Hierarchical Divine Liturgy on January 10 together with the concelebrants, Protopresbyter Lazar Vasiljevic, Protopresbyter and Episcopal Dean Predrag Bojovic from Seattle Parish, Presbyter Daniel Mackay with Deacon Rev. Stephen Dyer from St. Johns Parish in Eugene, Oregon, and Presbyter Vidoslav Vujasin and many parishioners and guests. The sermon based on the Gospel reading was given by Fr. Daniel Mackay. 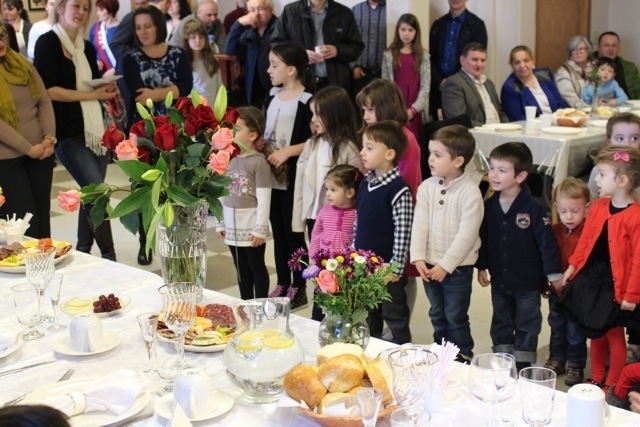 After the Holy Liturgy there was held a Litia around the Church building and the Slava bread cutting ceremony with the Kumovi Desimir and Duja Vidovic with their daughter Jelena. A delicious luncheon followed, which was prepared by the Kumovi and the Kolo Srpskih Sestara. During the lunch there was a short performance with the lovely children from the Portland Parish who sang a Christmas song for the Bishop and all guests. Michaela a choir member from the St. Johns parish in Eugene also performed two songs and brought joy to all guests. 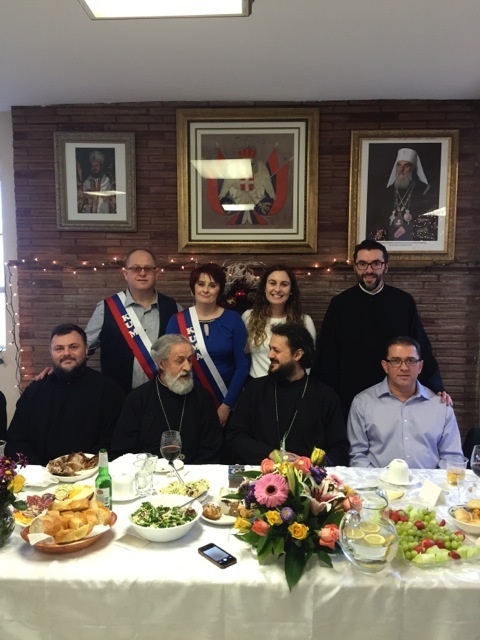 After the lunch there was an honorary event for two well deserved parish members, the deceased benefactor Gojko Jesic and Mr. Nikola Jankovic. They were decorated with an Episcopal grammata that they received by the hand of Bishop Maxim. For the deceased Gojko the grammata was received by his wife Simana with her sons Cedomir and Branimir Jesic. We are grateful for these many blessings and hope to grow spiritual under the guidance of His Grace Bishop Maxim, who is always very welcome in our Portland parish.